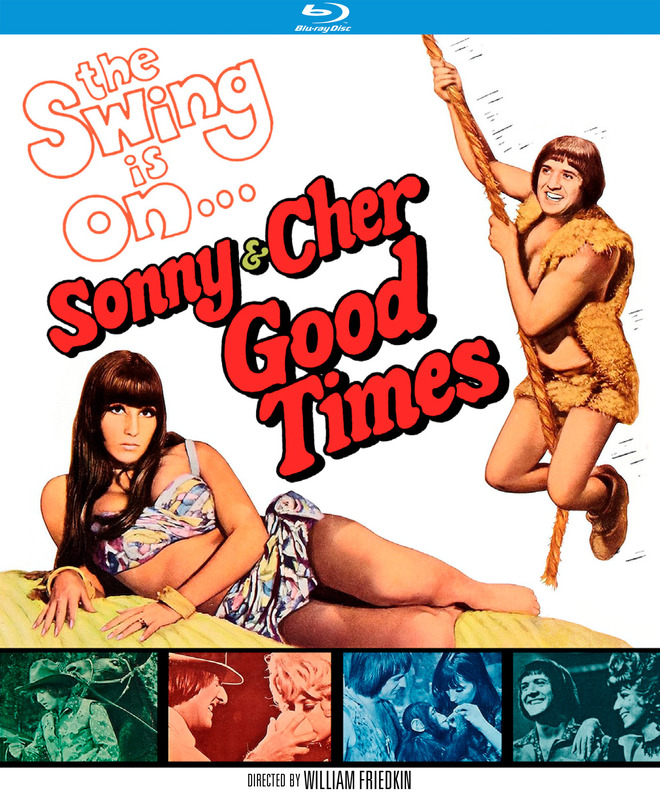 “Good Times” (1967, Kino Lorber) After confirming their pop star status by performing “I Got You Babe” (a re-recorded version, not the original single) , Sonny and Cher plot their ascent to movie stardom. But they don’t care for the project offered by Mephistophelean studio chief George Sanders – what the trades might call “hix pix” – and proceed to dream up alternatives, including a Western, jungle picture (filmed at the now-defunct Africa U.S.A. park in Soledad Canyon) and crime movie, all with Sonny as the lead and Cher as various distractions/femme fatales. Star vehicle for the then-married couple – which also marked the feature directorial debut of William Friedkin (“The Exorcist”) – aims for the anarchic counterculture comedy of the Beatles and Monkees’ screen efforts, but can only muster up a mild spoof of Hollywood tropes; however, it’s not the misfire that many would have you believe, largely due to Sonny and Cher’s nascent comic chops (which would get a better showcase on their ’70s variety series), a few well-composed musical numbers and a handful of solid singles, including the Spector-styled “It’s the Little Things” and “I’m Gonna Love You” (from Cher’s solo debut, “All I Really Wanna Do”), that underscore Bono’s producing/songwriting. Cher herself doesn’t have as much to do beyond serving as Sonny’s foil, but she does it with the charming insouciance that would inform much of her later acting career. Kino’s Blu-ray includes an interview with Friedkin, who warmly recalls both performers, and commentary by historian Lee Gambin, whose appreciation for the film is so breathlessly enthusiastic that water breaks or stretching may be required while viewing. “Queen of Outer Space” (1958, Warner Archives Collection) A rocketship is knocked off its interstellar course by a mysterious ray and marooned on Venus, where the all-male crew discovers that the planet is overseen by a race of women ruled by an imperious masked queen. TV and B-movie vet Laurie Mitchell plays the latter role (con brio), but it’s Zsa Zsa Gabor, as a Venusian scientist, who earns top billing in this deliberately ludicrous spoof of outer space adventures from “Twilight Zone” scribe Charles Beaumont. Gabor’s performance – slightly distracted, as if something interesting is happening just beyond the camera – strikes the right tone for the proceedings, which are reportedly drawn from a treatment by Ben Hecht (“The Front Page”); that’s a subject for debate, as historian Tom Weaver and Mitchell note on the Blu-ray’s commentary track, but what’s clear is that “Queen” is a cheap, silly gas – with footage, props and effects culled from director Edward Bernds‘ previous effort for Allied Artists, the delirious “World Without End” – though it’s worth noting that its dismissive tone towards the female characters, who are capable of building their own civilization and waging war but helpless beforestrapping astronaut Eric Fleming, may rank some viewers’ grooves. Warner’s Blu-ray includes a spotless new fullscreen transfer and the aforementioned commentary, on which a bemused Mitchell – who passed away in September 2018 – speaks kindly about Bernds (a prolific director who helmed numerous Three Stooges shorts), while Weaver details its breakneck production schedule, among other issues.